Due to electrical grid damage from Friday’s storm, and continuing repairs, it is anticipated that the intersection of Greens Farms Road/Bridge Street at Compo Road South may remain closed to traffic at least through the morning commute tomorrow (Monday, March 5). No traffic will be allowed through the intersection of Greens Farms Road at Compo Road South. Road closures will be in place at Bridge Street at Imperial Avenue, Compo Road South at Keyser Road, Greens Farms Road at Hillspoint Road, and Compo Road South at Elaine Road. Any destinations within this area will be accessible only to local traffic; all other traffic should must use detours. Drivers traveling from all points south of the I-95 overpass on Compo Road South should follow Compo Road South to Hillspoint Road north to the intersection of Greens Farms Road. From this point, traffic will be routed either east on Greens Farms Road and/or north on Hillspoint Road. Drivers traveling west on Greens Farms Road will be detoured north at the intersection of Greens Farms Road and Hillspoint Road toward Post Road East. No westbound traffic will be allowed on to Greens Farms Road from the Sherwood Island Connector. This area will be accessible to local traffic only. 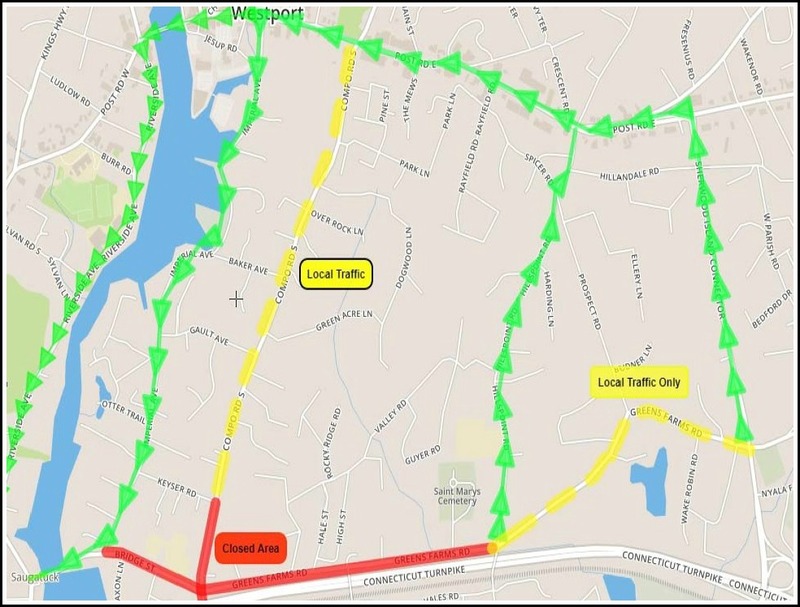 All other traffic will be diverted north on the Sherwood Island Connector towards Post Road East. Compo Road South will be completely closed to southbound traffic at the intersection with Keyser Road. All southbound traffic on Imperial Avenue will be diverted west on Bridge Street. All eastbound traffic on Bridge Street will be diverted north on to Imperial Avenue. The work may continue into Monday evening. This entry was posted in Police, Transportation, Weather and tagged Bridge Street, Compo Road South, Green's Farms Road, March 2018 noreaster. Bookmark the permalink. Hope nobody forgets to bring a cup of warm coffee with them….good luck all! what will the “poor” I-95 commuters do when they get off at exit 18. Immediately clog the Post Road. And what do the school buses do that travel through there?